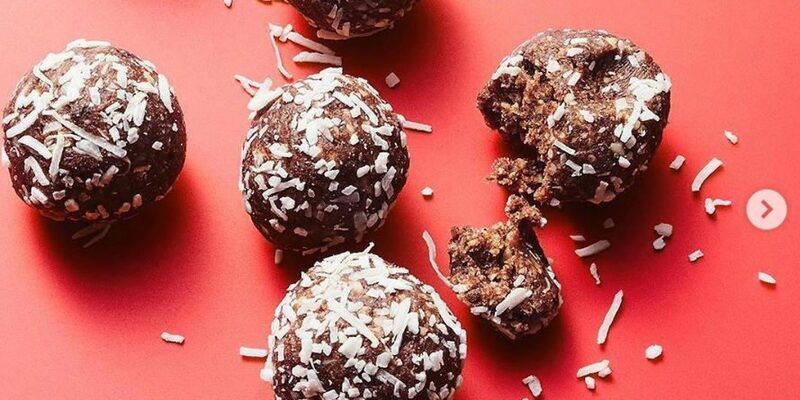 Since moving from England to Australia in 2012, I have learned the battles and glories to be had with building and maintaining a nutritionist career in Australia, Melbourne. From this experience, I have devised 10 top tips on how to be a ‘modern-day nutritionist’. 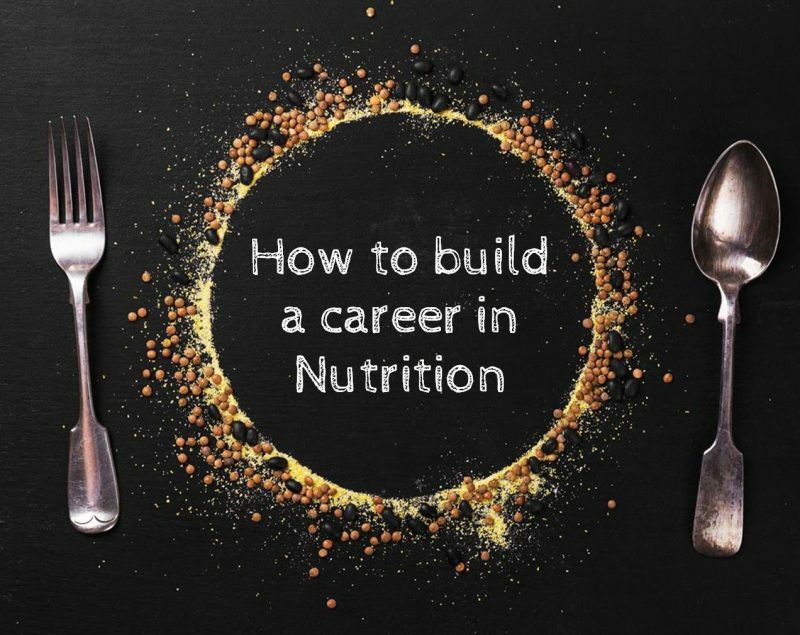 I delivered these same tips in March 2018 as a guest speaker for the Nutrition Society of Australia on the topic ‘how to build a career in nutrition in Australia’, with the intention of inspiring other nutrition-minded students and professionals. 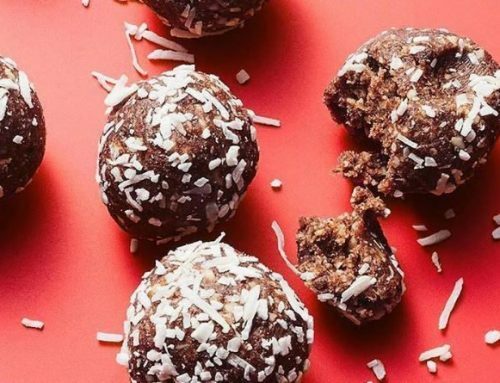 This blog will help anyone who wants to follow in a similar path, or who is looking for general ideas of how someone can take on a career in nutrition. I was born in Leicester, England, and was brought up with exercise and food being a central part of everything I did; excelling in swimming, tennis and badminton in particular. The first degree I started was in sports science, which gave me a depth of knowledge for anatomy, physiology and function movements. The module that I enjoyed the most was nutrition, which lead to two final degrees in nutrition sciences at a bachelors level and a masters in public health nutrition. In July 2009 I applied for my first job in nutrition after years of voluntary work with age concern. I clearly remember studying for two weeks solid on everything to do with this job role, and I had so much motivation to do the best I could that I even researched who the interviewees were, their interests, and planned for every kind of question I could be asked. 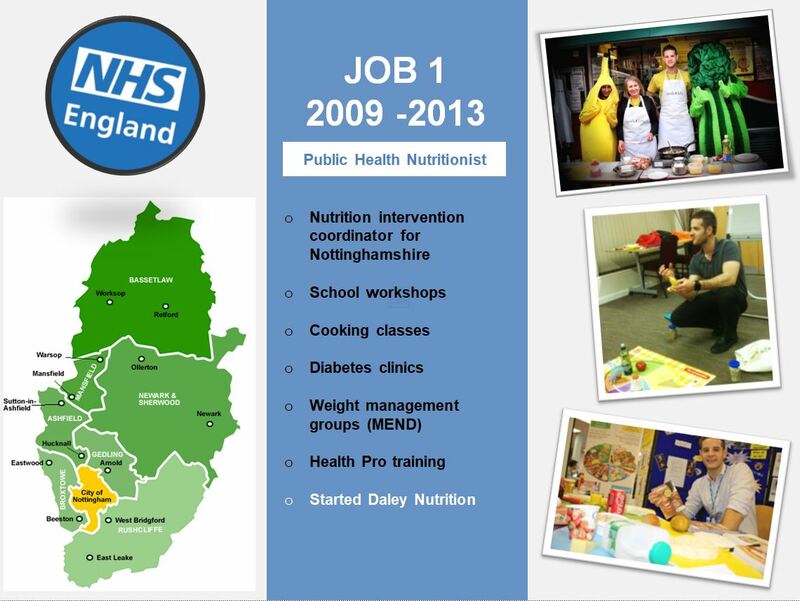 In November 2009, as a 22-year-old graduate, I started my first role as a Public Health Nutritionist in Mansfield, Nottingham. Nothing could have prepared for me for the job that was ahead. This role was a hands-on, drop in the deep end role to solve four main objectives in Nottinghamshire. Lead nutrition interventions in government areas Gedling, Rushcliffe and Mansfield for the National Health Service. 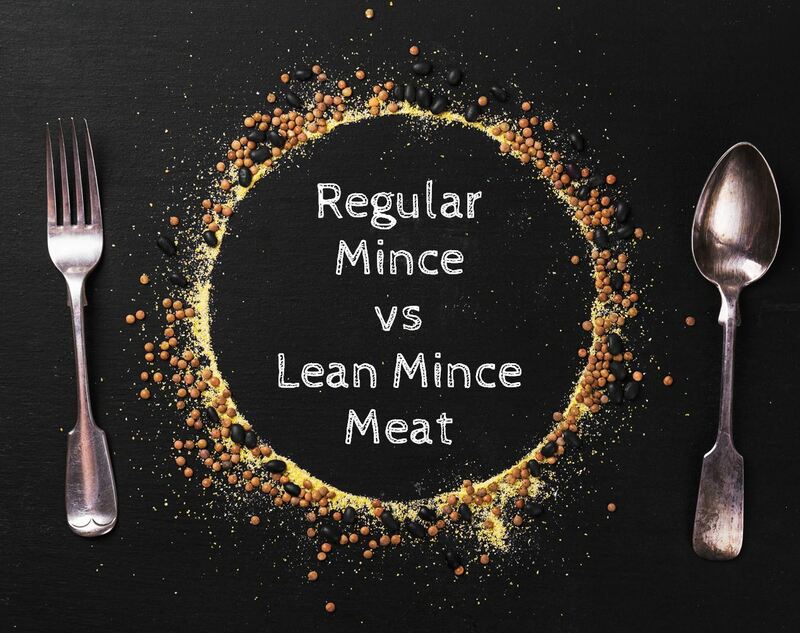 Counter the obesity epidemic in Nottinghamshire. Improve fruit and vegetable consumption with the public. Reduce sugary drinks consumption among younger generations. Working on the ground with these objectives I focused primarily on nutrition intervention programs in public schools, community centres, churches, hospitals and prisons. From this I built a vast variety of project management and guest speaking experience. After 2.5 years in this job role a lot of ego and arrogance had been knocked out of me, and I knew what my skills and my weakness were. 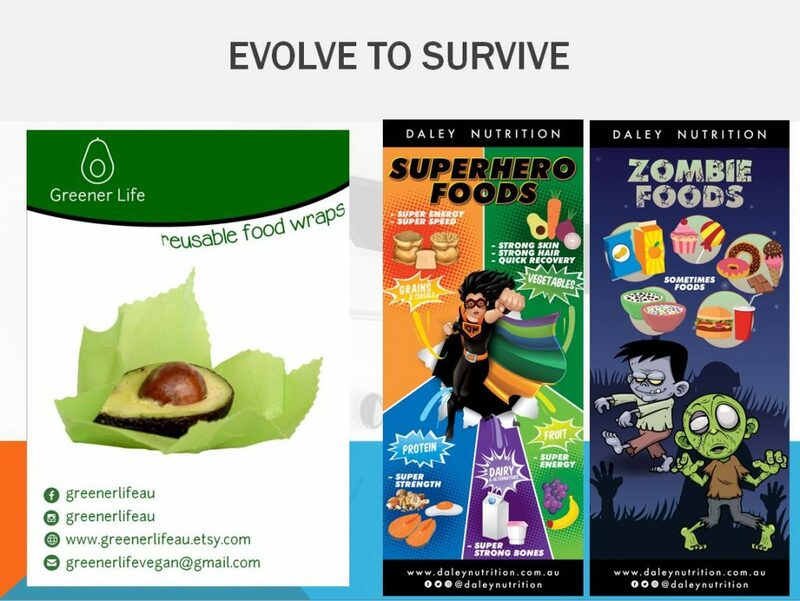 This knowledge and these skills were vital in setting up my personal business ‘Daley Nutrition’ and building a career as a Nutritionist in Australia. I moved to Australia in 2013 with my wife Carly. Before I met her I would never have imagined moving to the other side of the world for a future wife, but sometimes you have to drop yourself in the deep end and see what happens. Going from a new citizen to establishing a nutrition career, however, was not as easy as I had thought. For the first year getting a VISA was the biggest problem. I applied for every nutrition job going with all the key not-for-profit organisations, but kept getting turned down time and time again. Sometimes I would make it through to an interview and then get crushed with disappointments as my VISA was not strong enough on a working holiday VISA status. 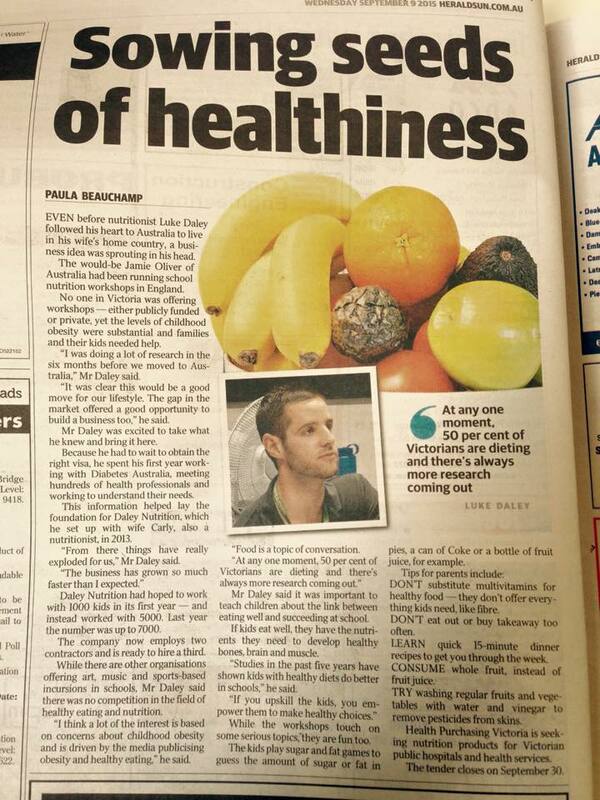 After a year of trying for a career job and a few part-time roles in some dodgy gyms, I finally had an interview with Diabetes Victoria’s Life! program as the training coordinator and managed to secure the role. I stayed with Diabetes Victoria for nearly five years after that, performing a range of roles including Aboriginal & CALD health promotion officer and communications officer for Parents Voice. During my five years, I completed a Cert IV in training and assessment as well as other personal training qualifications, but the most important thing I gained from my time with the organization was networks and contacts with a whole variety of health professionals and stakeholders. These contacts in the next few years helped me to secure nutrition roles at Nutrition Australia & The Victorian Aboriginal Health Service. 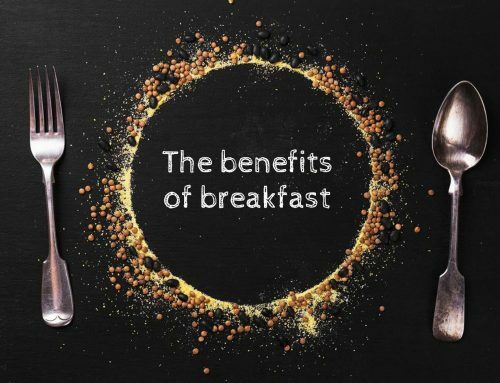 How did you set up Daley Nutrition? Daley Nutrition was set up in 2010 as a hobby to guest speak in local sports clubs and run some casual consultations. My Dad always taught me to have a backup plan in place in case you are left without a job and this was it. My wife and I played with our social media page and infographics while I was working for the UK National Health Service, however, we had no idea it would turn into a full-time role later in life. In 2014 my wife and I started to see nutrition education gaps in the market in Australia. 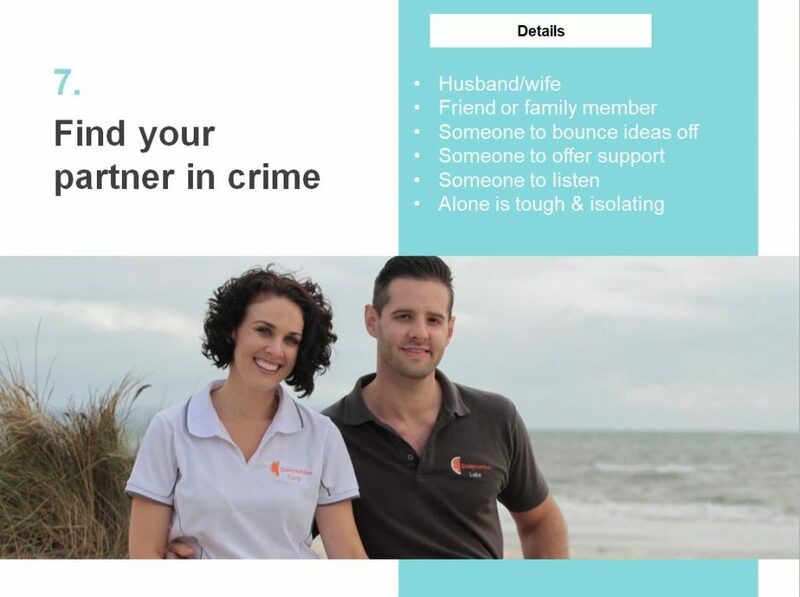 After a year of trial an error with setting up a marketing platform and trying to get our name out there, then out of the blue I had a random call from the Herald Sun in 2015 who caught wind of the work we had been trialling and the early success stories we had. The journalist from the newspaper published an article about Daley Nutrition, and before we knew it we were receiving calls and requires about our nutrition workshops and cooking demos. Sometimes you need a bit a bit of luck to kick start something, but this never would have happened if you didn’t put ourselves out there and had a vision of what we wanted to achieve. 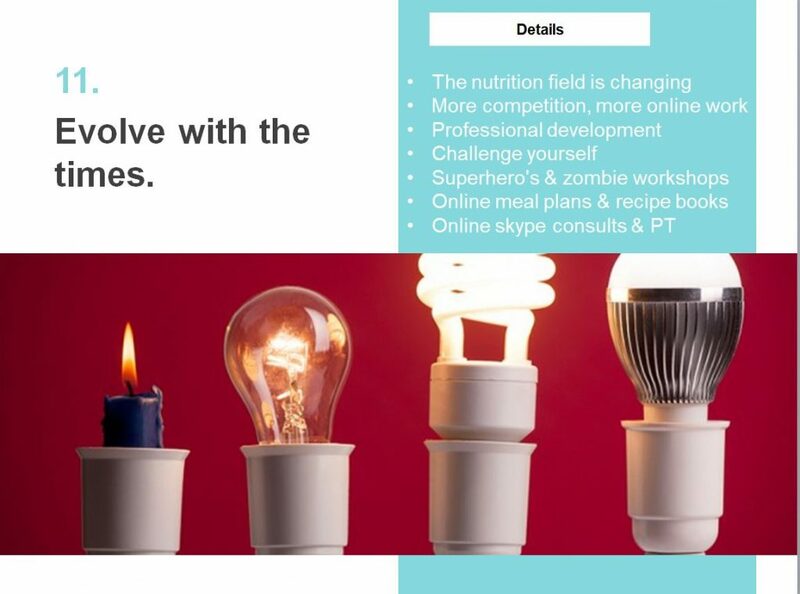 4 years on and we are educating 5,000 people a year about nutrition via workshops, cooking demos and guest speaking. 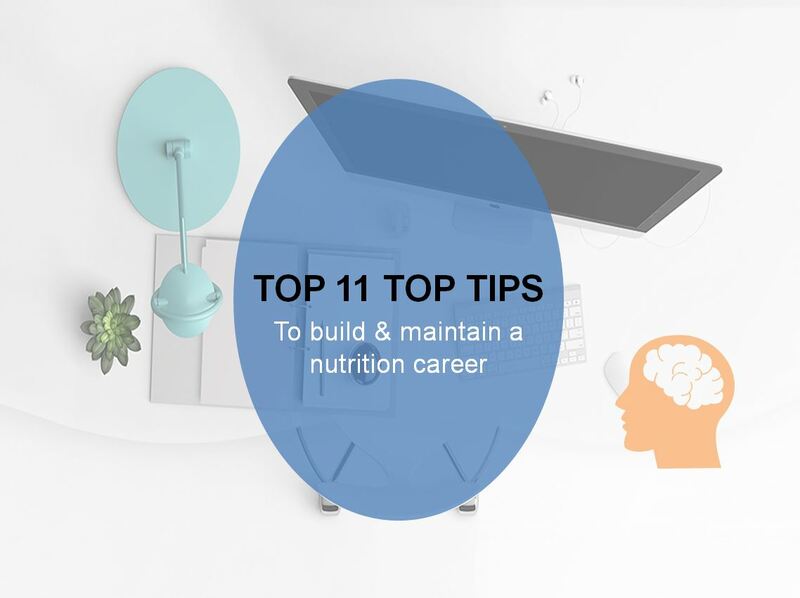 Below are my 11 top tips (everyone does 10 top tips) I believe every health professional should know when building themselves a career in the nutrition health industry in Australia. As a fresh out of uni graduate it can be hard to know which avenue to go down to secure your ideal future job. I remember when I graduated from my nutrition degree I didn’t really know what I wanted to do with the degree, I just knew that I loved to talk about food. 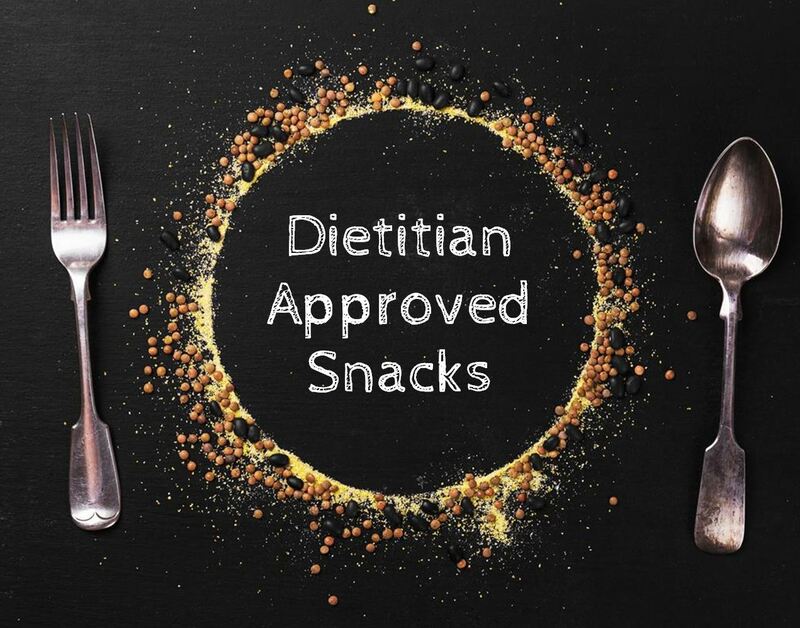 It wasn’t until my first job as a Public Health Nutritionist in 2009 that I started to learn about what I was good at and my nutrition interests. 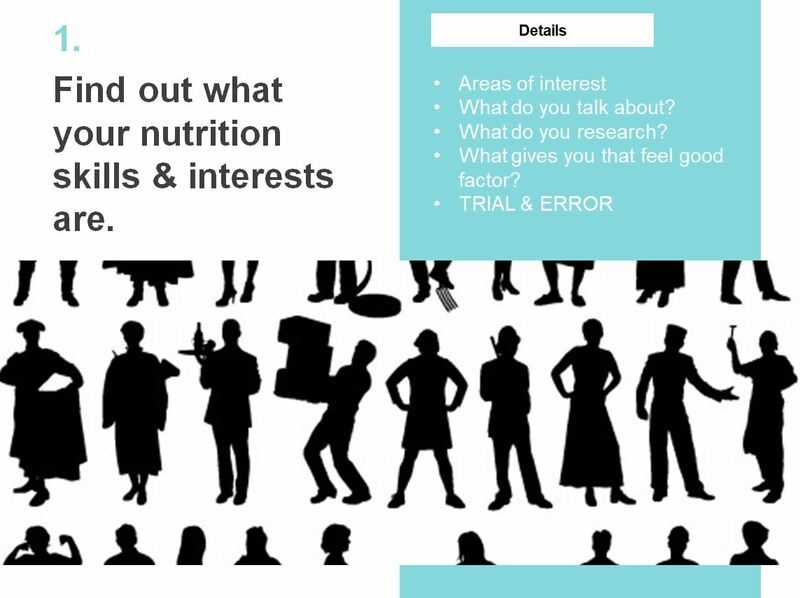 I encourage anyone undertaking a nutrition or dietetics degree to explore your interests whilst you are studying. Shadow a local Dietitian or Health Promotion Officer to get a feel for the different job roles and their responsibilities. Offer free healthy eating talks to your local probus group (as long as you have indemnity and liability insurance). This knowledge will help you to save time when you graduate and it means you can really focus in the job role that suits you. When setting up any business nowadays, especially a nutrition business, you need to get with the times and get online. At Daley Nutrition we use WordPress as our website server site, which is hosted with Net Registry. Learning how to use wordpress effectively with Search Engine Optimisation (SEO) has been crucial to getting our name out there on google. One of our most popular post is ‘are baked beans good for you?’ A simple question but nearly 250,000 people have viewed this in the last 4 years and has given my website a good google ranking. The other important angle of the internet is social media, I recommended focusing on two platforms such as Facebook and Instagram. Having keen followers of your work enables better connections to potential customers and more visits to your website. But make sure you have a bulletproof password to prevent anyone from hacking your accounts. We use Google analytics to find out who is visiting our website and it enables us to tailor our information to the right target audience. 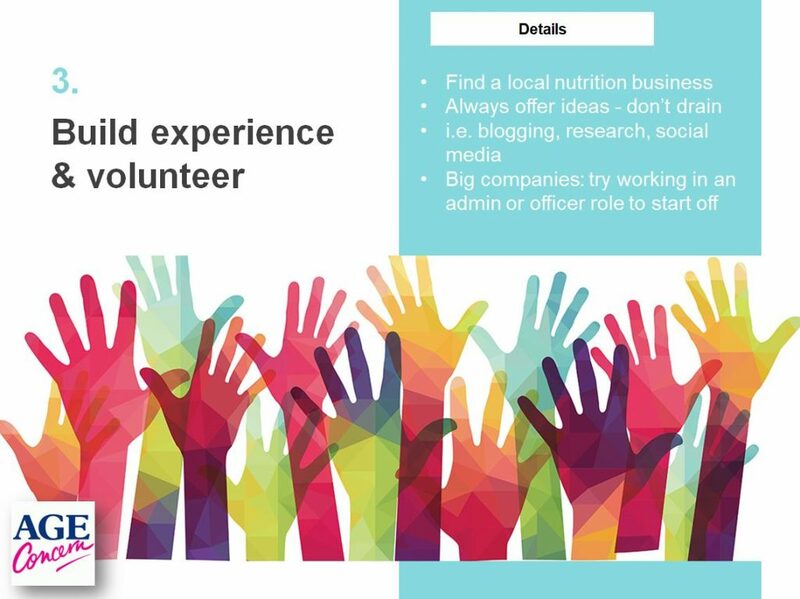 Volunteer with a local Nutritionist or Dietitian – offer to support them with their social media or blogging, this requires little maintenance and is a great way to get your foot in the door. There is nothing worse than a student who has no ideas of their own and is just there to drain your resources and time; always volunteer with the intention to help create new ideas. Get a back up income: this doesn’t necessarily mean a nutrition job, anything will do to give you a base income and it also looks good on your CV if you are working, never knock a cafe or shop assistant job for some easy income. If you don’t want to work for someone else, then work for yourself. This is no easy decision and will completely absorb your life for 1-3 years until you find your niche and some good contracts. But if this is what you want to do then go for it, but be prepared to find a supplement job to help you build your empire in the early days. Ask friends and family what they think you are good at (outsider’s perspective). Challenge yourself and try something new to see if it fits you. Write a list of what you love about nutrition and focus on the top 3. Do some research on google analytics to find what people are searching for and see if it aligns with your passions; if it does then you are on a good path to follow. 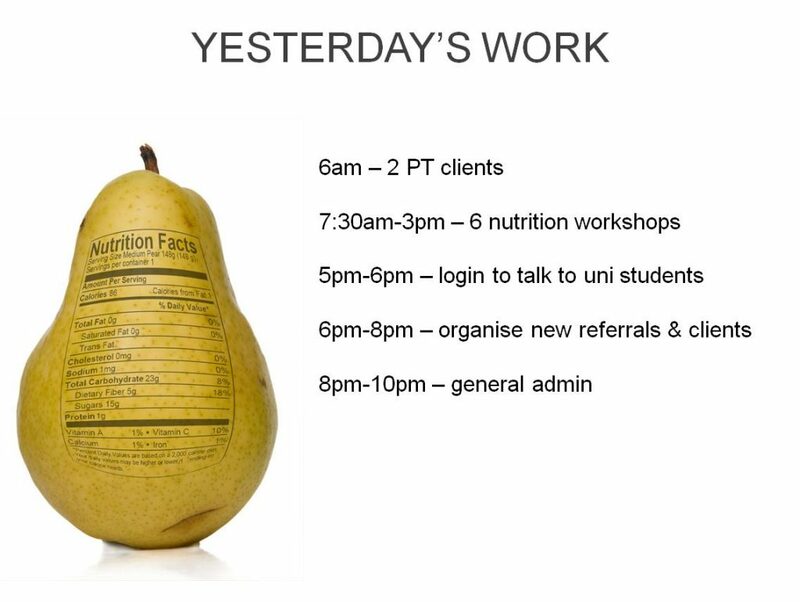 Unfortunately, nowadays you will struggle to find a consistent 9am-5pm nutritionist job, especially if your clients are workers. Often you will find yourself running consultations in the evenings or early mornings to capture clients before and after work. If you are thinking of running your own business then be prepared for working ten hour days, especially in the first few years of setting yourself up. 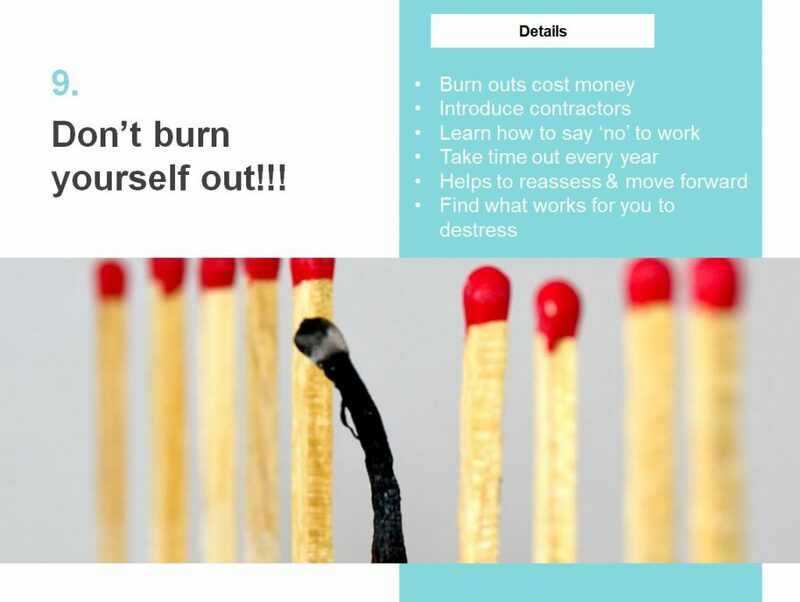 There are so many angles of running a business, such as advertising, social media, admin, meetings, fitting in clients, content development, working with accountants etc., and being flexible with work can lead to success, although be very wary that you don’t burn out. 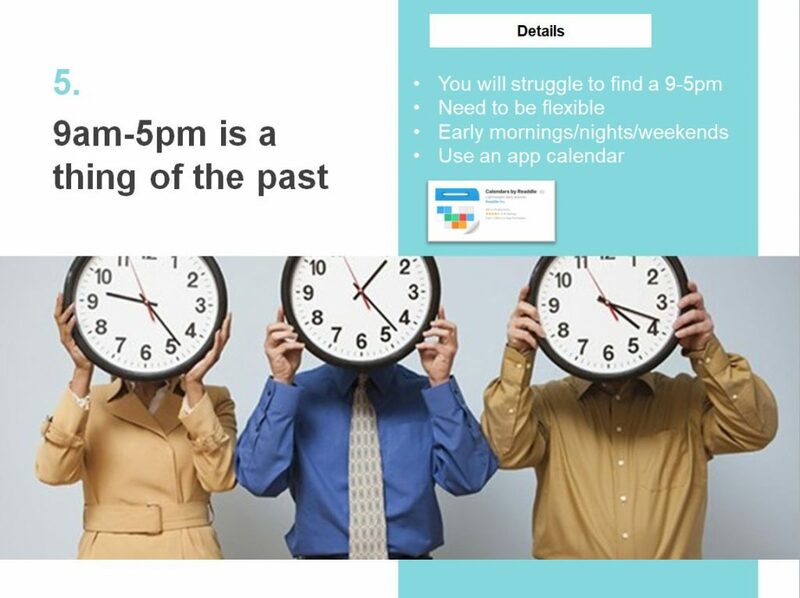 It has happened to me too many times and resulted in 3-4 weeks off work trying to recover, so take breaks, schedule it into your calendar and stick to them. Networking should be one of the core components of a successful nutrition degree. 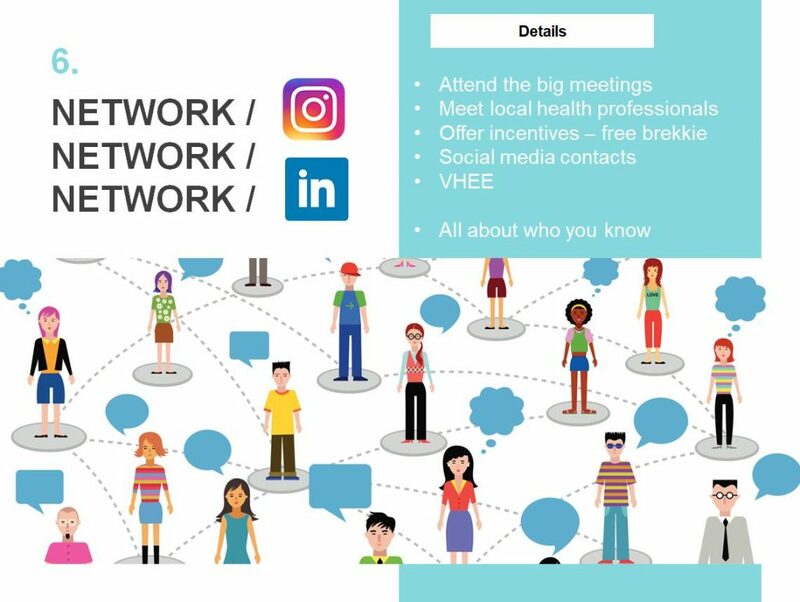 Social media, such as Linkedin and Facebook, is one of the easiest ways to connect with others. The social media I prefer is Instagram, as you can share your thoughts on topics and others will automatically comment and pass them on, however, there are lots of options nowadays so find the one that interests you the most. Networking also needs to be done face to face, as there is nothing more powerful in terms of networking than having a chin wag with someone over a nice Melbourne coffee. Reach out to local health professionals in your area and offer a coffee meeting; this gives you a platform to share ideas about health and your local community. 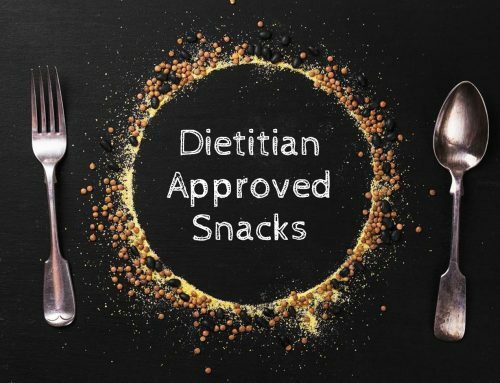 Conferences are also a great place to meet like-minded others; the Victorian Healthy Eating Enterprise, for example, is one of the best places to meet other Nutritionists and Dietitians. I have been fortunate to guest speak twice at this event and it has opened up some great networking opportunities. Working on your own can be very isolating and can really run you down, especially in the early days of setting up a business or starting a new job. It is important to find a sidekick or a best friend or a partner of whom you can share your successes, your stories and your stresses with. This helps you to grow as an individual and as an entrepreneur. I am very fortunate to have a wife who is amazing at details and organising, which complements my big ideas and spacey thought processes. Daley Nutrition wouldn’t be as good as it is now with this teamwork. The nutrition field is so vast and wide and always growing. 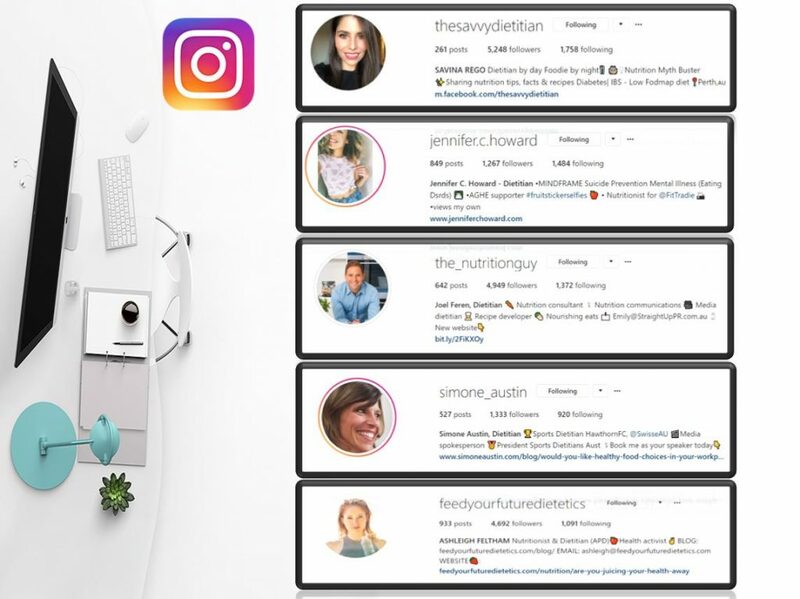 As a new graduate, or new nutrition business owner, it can be very hard to make a name for yourself unless you can connect with others who are on a similar path and who can understand you. Daley Nutrition partnered with Pacific Coast Eco-Bananas in 2017 to better reach and promote healthy eating in Victoria. Eco bananas is an ethical company that we believe in, who produce bananas in a sustainable way that looks after biodiversity and the environment, and results in a sweeter, long lasting banana. Dianne and her husband are big advocates for healthy eating and have enabled Daley Nutrition to reach higher levels of awareness by introducing a free banana to every school pupil we see in our school nutrition workshops. This partnership continues to this day and we love working with them. Another example of good nutrition partnership work is Netball Australia, who have partnered with Aussie Apples to better promote fruit. 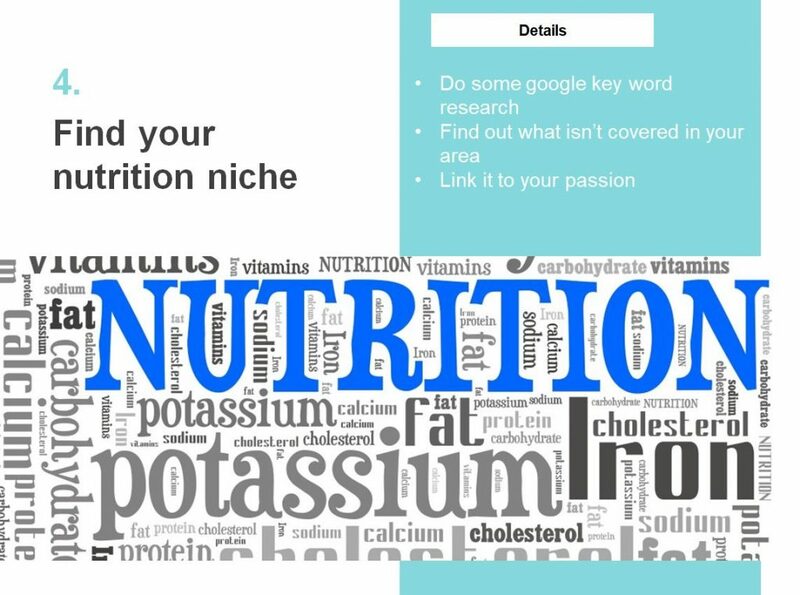 If you are in a similar situation to us a few years ago and are looking to build your nutrition work, I would encourage you email around to see who aligns with your work and who can help you to reach a larger audience promoting healthy eating. Initially, when you graduate or venture into a new nutrition job or business, it is easy to try and take on the world’s issues and focus on every aspect of nutrition. You will quickly find that when the work does start coming in it will often snowball, and it’s always easier to manage three snowballs compared to ten. I recommend you find out what are you good at, what you enjoy, what you can make money from, and focus on three main angles for your business. 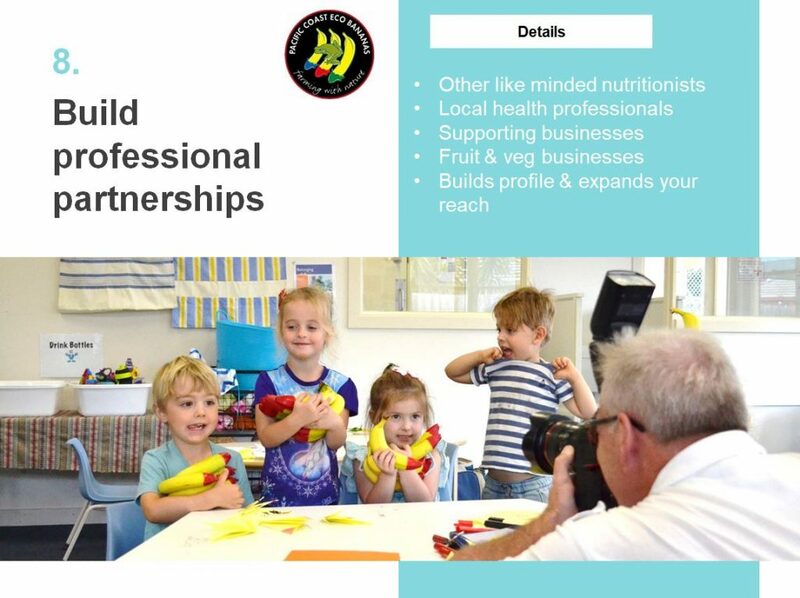 At Daley Nutrition our three main angles are school nutrition education, lecturing and nutrition consults/personal training. While it is good to evaluate what isn’t working for you and how you might need to evolve to find other revenue streams, you should always keep that three key aspect limit to your services, otherwise you will eventually burn out and having lots of burn outs early in a career can lead to resentment and stress. It is also important to find ways to de-stress and focus on your ‘me’, because without this you can easily turn into a slave of your own business. 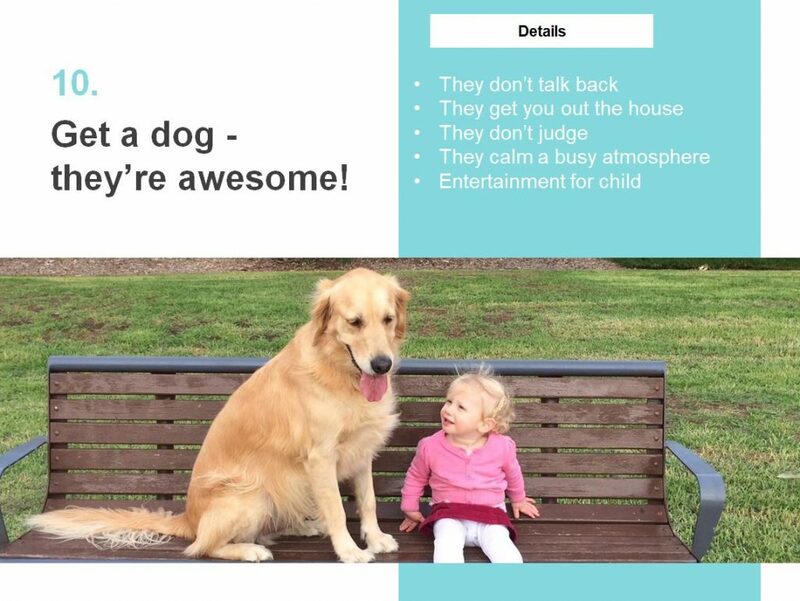 Get a dog – they’re awesome! Initially, when you are setting up a business or career, it can be easy to get obsessed with work and trying to succeed. Before you know it you are skipping meals, skipping breaks and this will lead to stress. Having a dog around helps you to relax, take a break, communicate, and taking the dog for a walk is a good opportunity to reflect and unwind. Our golden retriever, Bailey, is very good at staying close and letting you know when it’s time for walkies. Nutrition times are changing, more and more research is coming out about food and mood, food and chronic disease, food phobias, food as a form of communication….food this and food that etc. We are a nation based around food. Trends, diets, fads, technologies, research papers can change like the wind and you need to keep up and move with the times in order to stay relevant. Ten years ago, when I first started working in the nutrition field, Facebook was only just getting going in terms of nutrition. Ten years on, it’s big business and can draw in a lot of attention and reach. Face to face consults are now being replaced by online consultations, especially in hard to reach rural areas. 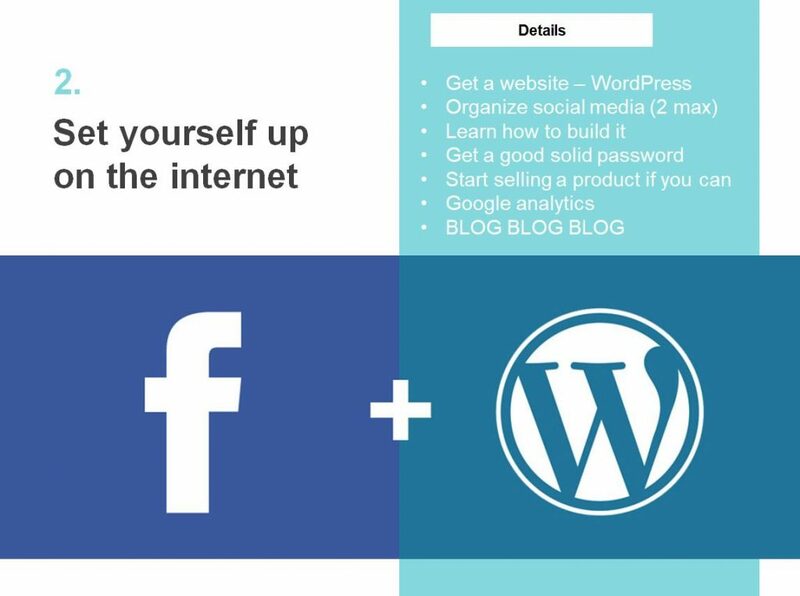 Being able to ‘go with the internet’ flow will be crucial if you want to grow a nutrition business. If nutrition consultations and face to face work doesn’t suit you, there are lots of other avenues you can take or test yourself with. My wife and I tried out making some reusable food wraps as we can’t stand plastic waste. Something that initially started as a hobby has now turned into another angle to our business. We now offer wholesale to producers such as Flora & Fauna. Offer skype and facetime consults. Run Superhero themed school workshops to draw in more attention and business. Focus a lot of time on website development and social media to reach wider audiences that could be potential customers. The worst thing you can do for your business is to hope that people will find your location and come and see you. You need to be proactive and get ahead of the times; buy magazines that predict future trends; go to those conferences that are always in other states and start planning for them now. 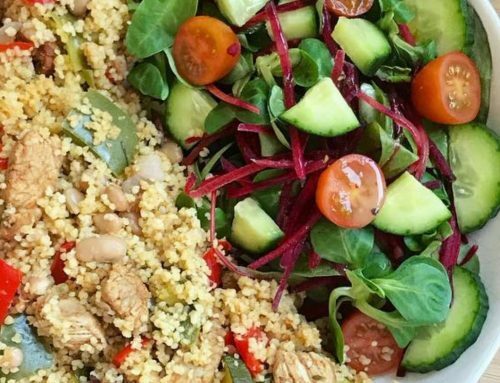 The Paleo diet has now been replaced by ‘plant-based diet’ as one of the popular food trends searched on google. Be prepared to talk vitamin B12 & iron levels with a new generation of 20-year-olds. In summary, I hope this post gives you some inspiration and motivation to build your own business or take that extra step in your career. It is no easy task building a nutrition career, but if you are determined, willing to go that extra mile and have a series of goals to achieve, then success is only around the corner. Feel free to say hi on social media and share your story, I spent most of my social media time on Instagram nowadays. Daley Nutrition is a community nutrition team based in Melbourne, Victoria. We run a range of nutrition based programs such as cooking demonstrations to raise people’s awareness of what they are eating and to empower them to change certain eating habits.